My newest piece, for percussion ensemble, will be premiered on Sunday, December 4, at 3 pm, in the Baldwin Auditorium. 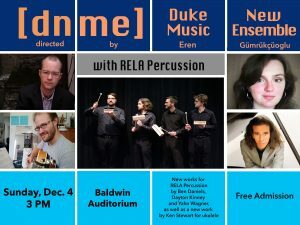 The Detroit-based percussion group Rela Percussion will perform it in a concert hosted by the Duke New Music Ensemble. You are all invited! tIme wrp-ng deals with the manipulation of our perceived time. Different techniques are used to invite the listener to an experience of various temporal perceptions. The title is a joke with the concept of “time warping,” which is an algorithm to analyze events over time, “time wrapping,” an abstract way of thinking how we could get our time wrapped, and “Wurupong“, which is a historic neighborhood in Ghana, borrowing a particular temporal perspective to this piece. The composer leaves the choice of the pronunciation to the performers and to the audience, who can choose between Time Warping, Time Wrapping, and Time Wurupong, or even something in between.